Liven up your residence by shopping with us for new laminate flooring in Bradenton, FL. When you visit our local showroom, you'll find an extensive collection of laminate options that complement your décor at a price that fits any budget. We are known for offering a full selection of products that are designed to make every space stand out. This flooring is both visually appealing and highly functional. The bold styles and competitive pricing of our brand-name materials enable you to tie your décor theme together without increasing your budget or sacrificing quality—something we believe every homeowner deserves. Our showroom and laminate flooring installation team are here to help you enhance every room of your house. Most homeowners love the look of hardwood and stone throughout their space, but many need a material that is more budget-friendly and easy to care for. When you are tired of paying top dollar for the same style, visit us and explore our selection. You'll receive the classic looks of your favorite natural materials, but at a competitive rate that fits your budget. These floors also don’t require the same high level of maintenance, so you save money in every aspect. 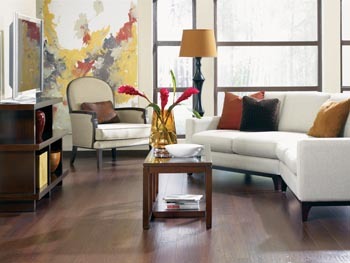 Laminate gives you the look of high-price floors for a fraction of the cost. There are countless laminate floors available on the market. With all of these products, it can be difficult to know which one is the right choice for your home. Fortunately, our team of professionals is here to help make the selection process easier. When you visit our showroom, one of our highly trained associates is happy to assist you throughout the sales process. They know the ins and outs of different brands, the types of laminate available, how to stay within a budget, and how to tie your laminate floor in with the other decorative elements of your space. Whether you prefer the elegant appearance of classic or the excitement of a contemporary look, we carry the perfect patterns and styles to fit any taste. At our showroom, you'll find laminate flooring in a complete range, including Green Select products that are made from sustainable natural resources and are recyclable. Our partnership with Interiors by Hix allows you to match or complement your laminate floor with window treatments too if you wish. We can guide you through our showroom to narrow down the options, and then you can take your floor home the day you buy it. Buying a new floor and replacing an old one can seem like a daunting task for a first-timer, but when you buy from us, it couldn’t be easier. Our service starts with a free in-home consultation and measurements, where you learn what will work for your home and how much material you need beforehand—without paying a thing. When you begin shopping, you can try before you buy via our My Floor Style app. It’s free and is easy to download to your tablet so you can see what various designs will look like in the space you plan to renovate. Plus, since we offer laminate flooring installation, you’re spared the hassle of having to find an installer. When you have to scour the classifieds to find a contractor, you just end up having to wait on your new floor and put your trust in someone who may not be qualified. Why do that when you could hire an extremely well-qualified installation team from our store right away? We install correctly with the intent of preserving the materials. Laminate is masterfully engineered in four layers, and we exercise precise care with each one because your satisfaction matters to us. We want you to love your floor for years. You should never have to sacrifice quality just to save a few dollars on your new laminate flooring installation. Whether you prefer the look of stone or hardwood, our collection features everything that you need to transform your home décor. Our products are designed to upgrade your space without causing you to go over budget. Once you have chosen the perfect pattern for your home, our experienced crews take care of the rest. They have the knowledge and expertise you need to perform your project correctly the first time. With us on your side, you can trust that your floors will look better than they ever have. Laminate is one of the easier floors to install and can often be done over the existing floor, which lets you enjoy your new investment faster. Contact our store to learn about all that we can offer you. We serve clients in Bradenton, Sarasota, North Sarasota, and Palmetto, Florida, and the surrounding areas.